Data structures, then and now. Data structures, then and now. And a bit about the script for the next chapter. For those of you wondering where todays comic update is or isn’t, take a look at the Changelog. I moved a seven page update earlier this week and as far as I’m concerned that counts as a content update. Visual continuity and all that. There have been quite a few edits since last week’s update and this past week being one of those weeks in which Work stubbornly refuses to exist I had no other pressures that I could meaningfully address so “todays” edits were moved as they were completed during the week. Today’s update is classical and modern directory tree screenshots. 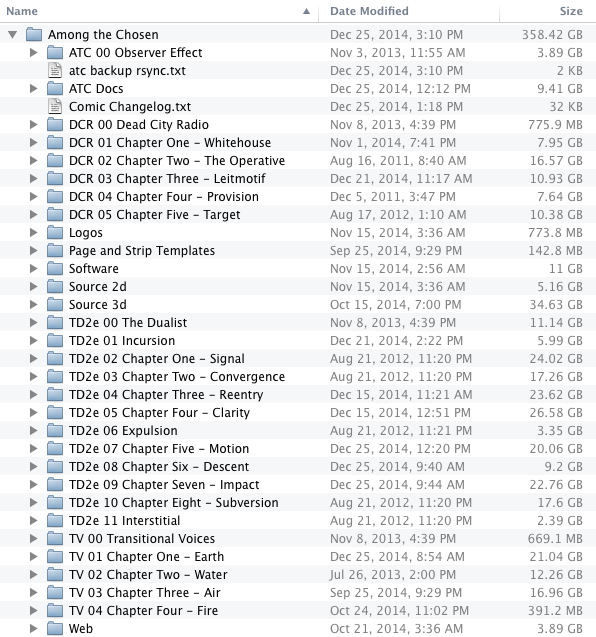 Data organization erotica, if you will. First, the ATC data structure in February of 2007, when The Dualist was still “ATC” and Dead City Radio was still DCR and Transitional Voices hadn’t started production yet and so on. A glimpse into “version one” – an alternate universe, if you will. Since 2007 the project known as ATC has expanded to contain Observer Effect, Dead City Radio, The Dualist and Transitional Voices, and the top level will probably look like it does now until around this time next year. The TV4 directory has been populated with page directories and blank page files, though work hasn’t started yet. The script is in development so I should have something positive to say about that in lieu of new content next week or some time after that. When TV4 wraps the tree should look a lot like it does now, only with larger directory sizes for Source 3d and TV 04 Chapter Four. Directory sizes for The Dualist are atypical compared to the other comics; this discrepancy makes sense when prior software limitations and page versioning is accounted for. The directory tree for The Dualist contains the first and second editions of the work, and the first edition pages used alphabetical incrementation to work around Photoshop 5 and 5.5’s limits on the number of layers in a document. I’m not throwing anything out; as recent edits have proved there’s good reason to hang on to all project data and good reason to keep it organized. 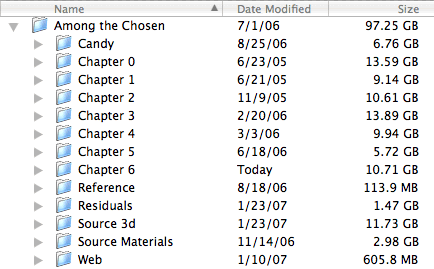 As to the non-book differences in the data structure… Candy has been filed in ATC Docs, Reference and Residuals and Source Materials have all been sorted and folded into appropriate directories or discarded. The tree could be a bit cleaner than it is but like the content it contains it’s a work in progress and at this point in time it gets the job done. When I move on to ATC 4 I might finally file the individual books in their own directories but at this point not doing that makes for less digging around. When a project has reached this stage of development the minor convenience of one less click here and there really starts to add up. As indicated above work has finally begun on the TV.4 script. It’s existed as an outline for years and various parts were drafted in 2012 and 2013, though those bits were developmental at best; conceptual at worst. As of yesterday there are modern words, the beginnings of actual scenes flying under the TV4 banner. As of this weekend I’ve all but solidified some potentially huge changes that may well change the tone entirely, and, just as importantly, may well eliminate another book from the series. I managed to strategically and explosively remove the book before DCR by working it into DCR and Transitional Voices; now I have the opportunity to maybe get rid of the book after the book after the book after Transitional Voices. TV is ATC Three and was ATC4 before the book prior to DCR was cut; I’d be getting rid of what is currently ATC Six, starting it here and letting it play out across ATC Four and Five with Seven bumped into Six’s position for numbering. Considering the fact that ATC seems to be taking roughly five or six years a volume to complete this is a good thing, and further plot economy is worth consideration and development so long as it works. That’s all for this week. Go check out the changelog. The plot hasn’t changed (much) but the art is now a hell of a lot cleaner in certain places. Enjoy! 87 queries in 0.777 seconds.